Last year I presented an idea I had for increasing tree canopy in urban areas on this blog and for the 2009 Policy Greenhouse held at George Washington University. You can read my complete blog post here. 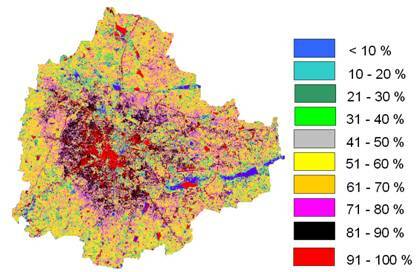 Another factor in the environmental performance of urban areas is the amount of impermeable surface that exists. More impermeable surface creates more and faster runoff, increases pollution in waterways, can cause localized flooding and can also contribute to the urban heat-island effect. Reducing the amount of impermeable surface can be achieved using a similar cap-and-trade approach as I recommended in the tree canopy post. - Landowners who do not reduce the required amount may purchase credits from those who have them in order to meet the requirement. 2) A parking lot property of 10,000 square feet has 9000 square feet of impermeable surface--6,000 square feet above the requirement. This parking lot owner buys the credits from the homeowner and other homeowners who have credits to sell until he meets the requirement. The beauty of a system like this is that the government sets the goal, but the market delivers the results. Simple supply and demand will control the price, and people will respond by increasing their impermeable space when the price is high enough to make it worth their while to do so.